Home Domestic News Championship Where’s Zingarevich Gone? One thing I have learn’t in my time as a Reading fan is the amazing ability of our loyal supporters to create incredible rumours out of nothing. It happens all too often, and the majority of the time I manage to keep myself away from them. However, there is one at the moment that has grabbed my attention, one which I can’t stay away from. Is Zingarevich looking for a way out? At the end of the 2011/12 season in the Championship, Reading fans finally got something they had wanted for a long time, someone with deep pockets to come in and inject a bit of money into the team and take us to that next step we couldn’t achieve otherwise. It all went so well, with Mr Zingarevich’s help we managed to push onto promotion, something we thought was impossible that season. But maybe, that all came too soon? In the summer, little money was invested into the team, there were a few free’s and minimal fees paid to get some players through the door. However, with some of the signings you wondered how much scouting went into finding them, and how much was the influence of Zingarevich. The signings made didn’t do enough, and by January we needed some real investment. Nothing came, apart from a last minute effort to sign back Gylfi Sigurdsson, which was a real panic attempt. 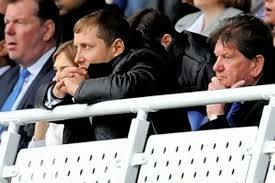 Reading were relegated and suddenly everything became far more realistic for our new Russian owner. Apart from the departure of Jimmy Kebe and Adrian Marriappa we have kept most of our squad from the Premier League together, with some new additions. However, these additions yet again did not cost the club very much, a small fee was paid for Williams but Drenthe and Bridge were free and Sharp is only in on loan. On top of the little money spent, Zingarevich has not been to a game since mid August, recently his wife did give birth to their first child, but even so it’s been a very long time. He seems to have gone very quiet and this has started rumours. There is a question over whether or not Zingarevich has the money, or whether it all comes from his father. It is questioned whether or not he knew the price of running a football club and whether he has bitten off more than he can chew. Rumours suggest Zingarevich was looking to remortgage the stadium to create the funds to finish the takeover deal, which has been delayed for more than a month now. The club are keeping their cards close to their chest, which is making the fans more worried. I think they need to come clean, and be more transparent with the fans and put an end to rumours and hearsay. As a Reading fan, I keep my fingers crossed that everything concerning the takeover is ok, but the club have to keep us in the loop.